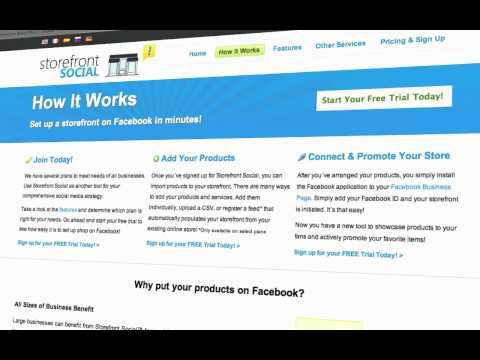 Create a facebook shop tab in minutes with Storefront Social. Generate more traffic to your ecommerce site by having your products available on Social Media. Engage your fans and encourage word-of-mouth marketing through creating an exclusive storefront on Facebook that enables your fans to talk about your products and promote to their friends. Stop wasting endless advertising budgets on Facebook and Google Adwords and for just cents a day you can provide your fans with the tools to talk about your products and spend your time harnessing the power of engaging conversations with your fans through social media. It takes hard work, but with our wide span of customers, we are learning tips and tricks that we share exclusively with our customers to learn how to promote their products better on Facebook. There are currently no reviews of Storefront Social. Products are available on Social Media and can be shared through Facebook, Twitter and even Google Plus. Create a branded storefront that connects directly to your ecommerce site so you don't have to manage two customer portals, deal with faulty security from conducting transactions through a social network, and promote traffic to your true converting site -- your online store! Save $$$ by not spending so much on advertising on Facebook and spend more time ENGAGING your fans to talk about you and your brand! Below are some frequently asked questions for Storefront Social. Q. What type of pricing plans does Storefront Social offer? Q. Who are the typical users of Storefront Social? Q. What languages does Storefront Social support? Q. Does Storefront Social support mobile devices? Q. Does Storefront Social offer an API? Yes, Storefront Social has an API available for use. Q. What other apps does Storefront Social integrate with? Q. What level of support does Storefront Social offer? Q. Which apps is Storefront Social compared to most often?